On August 14, 1941, President Franklin D. Roose­velt and British Prime Minister Winston Chur­chill signed the Atlantic Charter on a war­ship off the Cana­dian coast. The two leaders hoped that, fol­lowing the defeat of Adolf Hitler’s Ger­many, coun­tries around the world would re­nounce the use of force in inter­national rela­tions and estab­lish a per­ma­nent system of peace, free­dom from fear and want, choice of govern­ment, and secu­rity for all. On this date in 1942 Roose­velt, Chur­chill, Soviet Ambas­sador Maxim Litvi­nov, and Chin­ese Foreign Minister T. V. Soong (Soong Tse-ven) signed a short docu­ment (181 words) that later came to be known as the United Nations Decla­ra­tion. The next day the repre­sen­ta­tives of twenty-two other nations added their signa­tures. This docu­ment con­tained the first offi­cial use of the term “United Nations,” which was sug­gested by Roose­velt to distin­guish the Allied from the Axis, or Tripar­tite, war­time alli­ance. In the docu­ment the repre­sen­ta­tives vowed to em­ploy all mili­tary and eco­no­mic re­sources against the “savage and brutal forces seeking to sub­ju­gate the world.” Citing a com­mon pro­gram of pur­poses and prin­ciples em­bodied in the Atlan­tic Char­ter, the nations vowed to defend life, liberty, inde­pen­dence, and reli­gious free­dom at home as well as else­where. These aspi­ra­tions were en­shrined in the 111‑article Char­ter of the United Nations, which was offi­cially adopted by the dele­gates of 50 nations at the San Fran­cisco Con­fer­ence on June 26, 1945, a month and a half before World War II ended with the sur­render of the last Axis power, Japan. All the dele­gates hoped that the new U.N. organ­i­za­tion would suc­ceed where the old League of Nations had failed, in large part because the United States, the most power­ful nation on earth after the First World War, had not joined the League. Nearly four months later, on Octo­ber 24, 1945, the five per­ma­nent mem­bers of the Secu­rity Coun­cil, con­sisting of China, France, the Soviet Union, Great Britain, and the United States, along with a major­ity of other signa­tories, rati­fied the organ­i­za­tion’s char­ter, and the U.N. offi­cially came into existence. 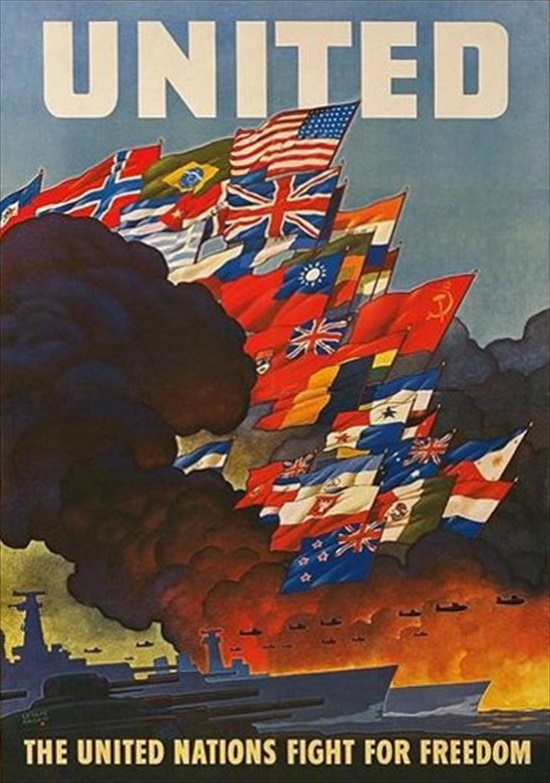 Above: Poster created in 1943 by the U.S. Office of War Infor­mation and printed by the U.S. Govern­ment Printing Office following the Declara­tion of the United Nations of 1942. The poster fea­tured the flags of those coun­tries or govern­ments-in-exile (with the un­usual excep­tion of the Free French) that pledged to sup­port the Allied war effort against the Axis powers. Beginning from the top-left corner and con­tin­uing in rows from left to right: Haiti, Nor­way, Brazil, the United States, Cuba, the Domin­i­can Repub­lic, the United Kingdom, Greece, Guate­mala (behind the British flag), South Africa, Czecho­slo­va­kia, China, Ethio­pia, Luxem­bourg, Canada, the Soviet Union, Bel­gium, Boli­via, Yugo­sla­via, Hon­duras, Pana­ma, Iraq, India, Costa Rica, El Sal­va­dor, Aus­tra­lia, the Philip­pines, Poland, Mexico, the Nether­lands, and New Zealand. 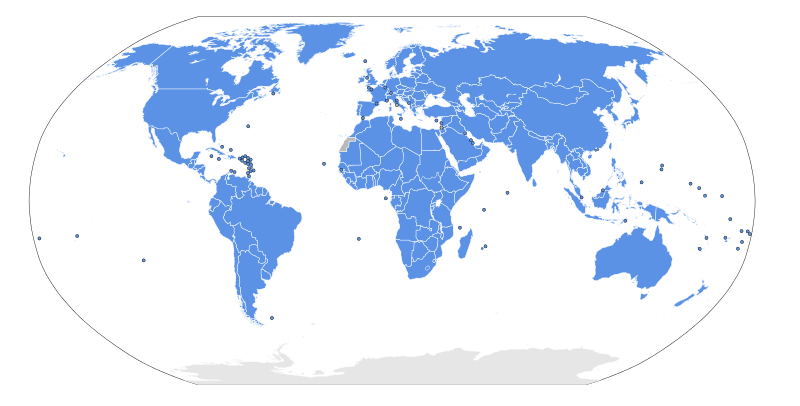 Above: Map of the 193 United Nations member states, with their terri­tories (in­clud­ing depen­dent terri­tories) recognized by the UN in blue. 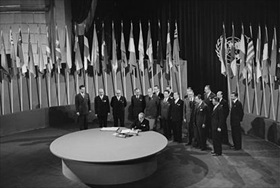 Left: Joaquin Fernandez Y Fernandez, Minis­ter for For­eign Affairs and Chair­man of the dele­gation from Chile, signs the U.N. Charter at a cere­mony held at the Vete­rans’ War Memo­rial Building in San Francisco on June 26, 1945. Only those states that, by March 1945, had declared war on Ger­many and Japan and sub­scribed to the United Nations Decla­ra­tion were invited to take part in the San Francisco ceremonies. Right: The first meetings of the United Nations General Assem­bly (51 nations repre­sented) and the U.N. Secu­rity Council took place in Lon­don begin­ning Janu­ary 6, 1946. The Gen­eral Assem­bly selected New York City as the site for its head­quarters, and the new facil­ity was com­pleted in 1952. 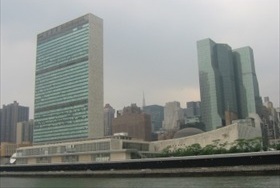 The New York site—like U.N. head­quarters buildings in Geneva, Vienna, and Nai­robi—is desig­nated as inter­national territory.